PC Reports are a series of quick first impressions regarding the technical aspects of a PC game. 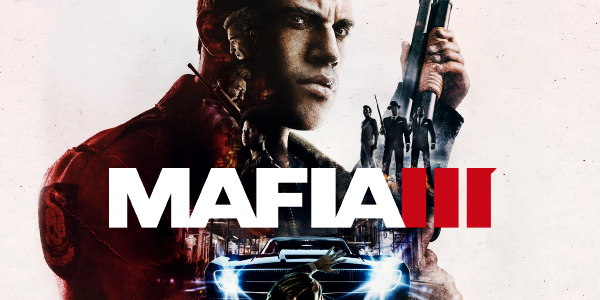 For an up to date account of Mafia III fixes and improvements, please visit its respective PCGamingWiki article. Developed by Hangar 13 along with 2K Czech and published by 2K Games. The game was released on October 7, 2016 for Windows only. The main focus of this report is to aid users in finding the most optimal and best looking graphical settings in order to solve and even prevent most framerate issues. While the system requirements may not look like much, expect extremely low framerates for any systems meeting the minimum requirements. Many systems will need to launch the game at a fairly low resolution in order to achieve a stable framerate. Faster higher end systems are required in order to run the game at a smooth framerate. Players are unable to access the main menu right away once the game starts. On the very first launch they'll have to sit through a small cutscene before they can change their settings, however the cutscenes themselves can be skipped. Any settings modified in the launcher will be ignored, all graphical settings need to be setup again while playing. If by default the game is running at 30 FPS then launch the game, open the main menu and navigate to the Options menu, then click on the third icon called Display, then under FPS select 60 or Unlimited. If the game looks blurry after changing the resolution, set Fullscreen to Off and then to On. There are quite a few missing options, such as a texture quality setting seeing as very often most textures might have a blurry look to them. The game has two settings called Geometry Detail and Shadow Quality which are supposed to help with the low entity draw distance, however pop in will be frequent even when these two settings are maxed out seeing as lights and over objects will often appear out of nowhere while quickly moving the camera around. Certain settings such as the Ambient Occlusion, Depth of Field, Chromatic Aberration and the Antialiasing cannot be disabled. Certain values lack Off settings and can only be set to Low. This effect cannot be disabled even when set to Off. This setting cannot be disabled and most changes are barely noticeable, there is not much point in using any higher values. Certain objects and most characters will subtly be darkened, notice the door and the walls around it. This can be difficult to spot while playing. Click on the image to see an animated comparison. This image is best viewed in a fullscreen tab. This setting should be left on Low. Even though the performance hit looks minor cars and other actors might induce extra stuttering. This effect is mainly applied while moving the camera, the effect itself is highly exagerated. There shouldn't be a performance hit but this setting might induce some slight stuttering, disable it if desired. This setting mainly controls the draw distance of ground decals, lights, objects and their shadows along with their level of detail. There is frequent pop in even while using the highest setting seeing as the overall extra range is pretty small. Notice the additional manholes and the shadows while using a higher setting. At lower values trees and other foliage will have a blockier look from far away, their shadows will also be loaded only while getting closer. This setting also sets when an object should begin casting its shadows depending on how close the player is. The setting itself can also affect other smaller objects. When farther away parts of certain models will also be partially hidden. Even while using the highest values lights will often pop in and suddenly appear out of nowhere. This side effect is mostly noticeable while quickly moving the camera around. When the higher values are used smaller buildings will begin loading their interiors, along with their objects and textures, any building decals and any lights will also be loaded from farther away. Click on the images to see the animated comparisons. They are best viewed in a fullscreen tab. Even while using the highest value not every object will be fully rendered while seen by the player. Because of the tiny distance smaller items such as these water coolers will have missing water tanks while far away. The interior draw distance can often be a little bit extreme, with objects appearing out of nowhere as the players gets closer. This setting doesn't affect a car's rear view mirror, notice the car's lights being partially hollow. There shouldn't be a performance impact while using this setting and it can easily be left on High. However higher values may introduce stuttering on slower systems. This setting doesn't affect the shadows themselves, it mainly sets how close a player should get before certain shadows can appear and it also partially controls their draw distance, although the differences between the three settings are pretty insignificant seeing as the extra range is pretty small and pop in will still be frequent. This setting works best along with the Geometry Quality setting. Higher values don't get rid of the shadow banding effect or of the shadow flickering effect which is sometimes present on flat surfaces or over certain vehicles. Interior areas are barely affected by this setting, ambient occlusion was mainly used for most shadows. This setting can be pretty picky when it comes down to which objects should have their shadows rendered from far away, notice how the water cooler is the only object being affected by this setting. Shadows are often inconsistent, with only certain characters having them, notice the two guards on the right. This setting doesn't help with this problem in any way. Certain shadows are often distorted when displayed over odd surfaces. There isn't much of a visual improvement, however this setting shouldn't affect the overall performance and it can easily be left on High. This setting mainly controls how windows, water surfaces and how certain reflections will look like when cast over other objects. There is a minor visual impact and even on the highest setting certain objects are not affected, car mirrors have a fairly low quality look to them. Reflections will appear as blurrier at lower settings and crisper at higher values. There are minor differences between the Medium and High values. When set to a value of Low certain textures, such as the bank's ground floor will appear as blurrier. Most differences are very difficult to spot during usual gameplay, most changes will only be clearly visible over the water surfaces. Vehicle reflections are not effected by this setting. When set to Medium or High this setting can have a pretty large performance impact over the game, while barely improving the look of most scenes. Set it to Low to ensure a higher framerate. Set it to Medium for the best balance between quality and performance. This setting didn't have any visible visual impact, however it can drastically affect the overall performance. It should always be set to Low in order to maintain a more stable framerate. The antialiasing technique present in the game is very weak. It does a very poor job at masking most jaggies. This setting will also affect any objects present in the rear view mirror. Most systems should be able to handle this setting, however the overall visual impact should be minor, if needed set this setting to Low. When set to High everything might look a little bit too blurry. These are the optimal settings used for this system for usual gameplay. These settings are balanced in order to provide the best performance and visual quality possible. Among the most performance intensive choices are the Volumetric Effects and the Reflection Quality setting. Lower any of these options in order to gain a significant performance boost if the game is running poorly. For the best experience set FPS to a value of 60 on normal screens or to Unlimited while playing on a high refresh rate screen. The overall framerate was extremelly unstable and mostly poor while playing, the system doesn't manage to keep up with the game while driving around. The frametime delivery was never consistent, microstuttering being present almost everywhere. While lowering the more intensive graphical settings helped overall the game never managed to perform too well. Some fairly standard audio settings. Most keys can be remapped, the game offers some pretty standard settings. The game features an auto centering camera while driving which cannot be disabled. Overall most settings shouldn't change the look of the game itself, if a higher framerate is needed lowering the Volumetric Effects and the Reflection Quality settings might help the most, however the system might fail to keep up with the game, currently far more higher end systems are needed in order to run the game at 60 FPS. Stable framerates might not be obtainable by simply lowering most settings, higher end hardware might be needed instead. Lower end systems will barely manage to run the game at a playable framerate, systems around the minimum requirements will not be able to run the game at high framerates. Higher end systems meeting the system requirements might also struggle. just a small question about Geometry Detail, you said "This setting mainly controls the draw distance of ground decals, lights, objects and their shadows along with their level of detail. ", i'm interested in this part "objects and their shadows along with their level of detail. ", how does geometry detail control the LOD of objects, is it just their draw distance? as you get closer you see more detail? or is it permanent like if you have Geometry on low, no matter how close you are the object is rendered at a level of detail and to see the full level of detail you have to set it to high?